There seems to be a formula for kids' movies these days. Take a main character (a polar bear, in this case), give them some goofy sidekicks (ragtag lemmings here), and send them on a journey to write the wrongs of the world (to NYC to thwart the construction of luxury condos in the Arctic). Oh, and always throw in lots of potty humor. I don't know about you, but I think filmmakers need to start thinking outside the box when it comes to family films. Give us something new. Pixar can't be the only studio who does this, can they? 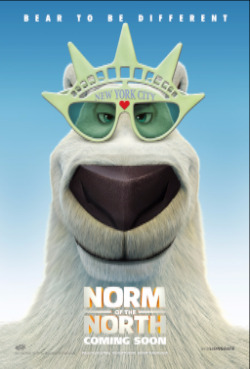 At any rate, "Norm of the North" has a good voice cast, including Rob Schneider as the aforementioned Norm, Colm Meaney, Ken Jeong, and Heather Graham. But families are better off skipping this one in favor of better eco-friendly films like "Happy Feet." "Norm" isn't the worst family movie I've ever seen, but the animation is dated and the writing phoned in. PARENT INFO: "Norm of the North" includes lots of potty jokes, slapstick humor, some innuendo, a scene involving a tranquilizer gun, and an apparent death.